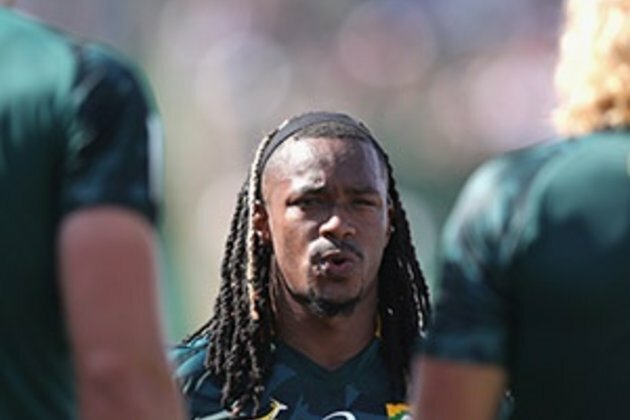 Cape Town - No-one has played in more matches for the Springbok Sevens team than Branco du Preez - 350 to be precise - but even the ever so calm Blitzbok playmaker had no words to describe the way in his which his last outing in the green and gold ended. Du Preez, who tied the all-time appearance record for South Africa in the World Rugby Sevens Series on Saturday with Kyle Brown (69 tournaments), thought he had seen it all in his nine years with the Blitzboks. The feeling he had after what had happened on Sunday in Singapore - where the South Africans overhauled a 19-0 deficit to beat Fiji 20-19 in the final - was indescribable for Du Preez. "The moment feels unreal, to be honest," said Du Preez. "What I do know is that it feels pretty special to celebrate my 69th tournament in this way." Du Preez played in his 350th match against Fiji, whilst Brown represented South Africa in 347. He still shares the milestone for most tournaments with Brown, who clocked the 69 mark earlier this year in Sydney. "Equalling Kyle's mark will still sink in - it is just such a great feeling," said Du Preez. "What makes it more special is the fact that I can share it with great team-mates, with my family and with all our fans in our wonderful country. This was for all of them, not for myself." Du Preez also extended his Blitzboks career record for conversions to 398 - which places him in ninth position on the all-time world list - and he is the second highest points scorer of all time for the Blitzboks with 1 253, only behind Cecil Afrika (1 430). Seabelo Senatla (1 120) is third. - Selvyn Davids is the leading points' scorer this season, with 175 points. - Siviwe Soyizwapi is the leading try scorer for the team with 27, followed by Werner Kok (18) and Selvyn Davids (16). - Soyizwapi is also the leading try-scorer in the history of the Singapore Sevens, with 19. - Werner Kok leads the World Series stats for tackles made this season with 107. - Kok (20), Ryan Oosthuizen (14) and Stedman Gans (14) made the most tackles for the Blitzboks in Singapore. - Soyizwapi and Kurt-Lee Arendse scored the most tries for SA in Singapore with four each. - Selwyn Davids scored the most points for the Blitzboks in Singapore, with 22.